Brand name prescription medications are expensive. That fact shouldn’t be news to anyone. What’s surprising is the rate in which these medications are going up in price. In the last few years the price of nearly every brand name prescription medication, all of which were very expensive to begin with, have skyrocketed at many times the rate of inflation. In order to quantify exactly how rapid the rate of these medication prices are going up, I compared the average price retail pharmacies in the US paid for 400 brand name listings of more than 100 medications over 4 years. I compared what pharmacies in the US paid (the NADAC price) for these medications on the first week of October 2012 to what they paid for the same medications on the first week of October 2016. This list consisted of both brand name prescription medications for which no generic version was yet available as well as 92 listings that had inexpensive generic equivalents in 2016. All of the drugs used were listed on the NADAC price lists for October 4, 2012, October 10, 2013, October 8, 2014, October 7, 2015 and October 5, 2016 for comparison. What I found was both shocking and yet not shocking at the same time. Of all the medications on my list, only one medication (Podofilox ) dropped significantly in price and three other medications dropped by less than three percent in price. All other brand name prescription drugs on my list went up in price. The average amount all of the medications on the list increased in price was just over 72% in only 4 years. For comparison, the average rate of inflation during that period of time was only 5.15%. That means that brand name prescription medications have been going up in price at about 14 times the average rate of inflation since October 2012. 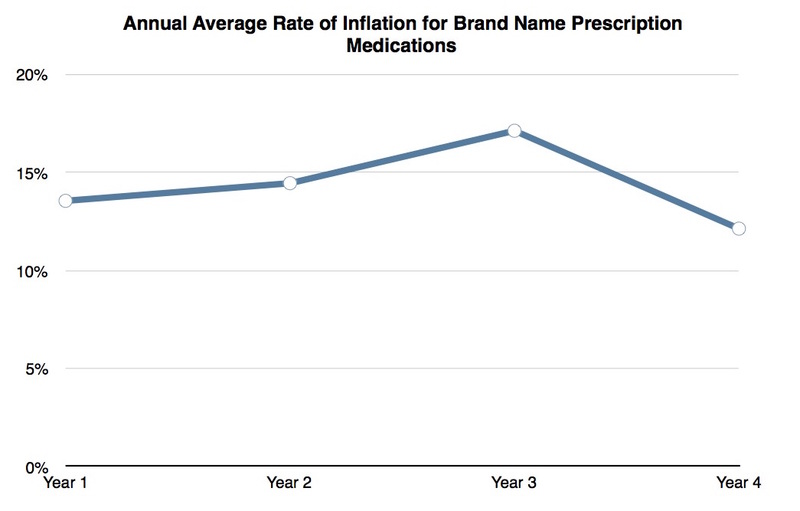 Figure 1: The annual average rate of inflation for 400 brand name prescription medication listings has ranged between 12-17% from October 2012 to October 2016. Here’s a PDF list of the medications I compared along with their prices to show how much they cost and how much their prices have risen. Surprisingly, the prices of brand name medications went up regardless of whether there were inexpensive generic equivalents for the medications. 92 of the medications on the list had very inexpensive generic equivalents, yet nearly all of these medications rose an average of over 11% in price in the last year as well. So, why are the prices of these drugs going up as quickly as they are? One reason is that there’s nothing to stop the pharmaceutical companies from raising their prices. A pharmaceutical company has a monopoly on any medication that’s still protected by a patent. Also, here in the US, there are absolutely no laws that protect consumers from price gouging by the pharmaceutical companies. But even without a patent there appears to be no limit to what the pharmaceutical companies will charge for their products. This shows that the pharmaceutical companies are getting very desperate. 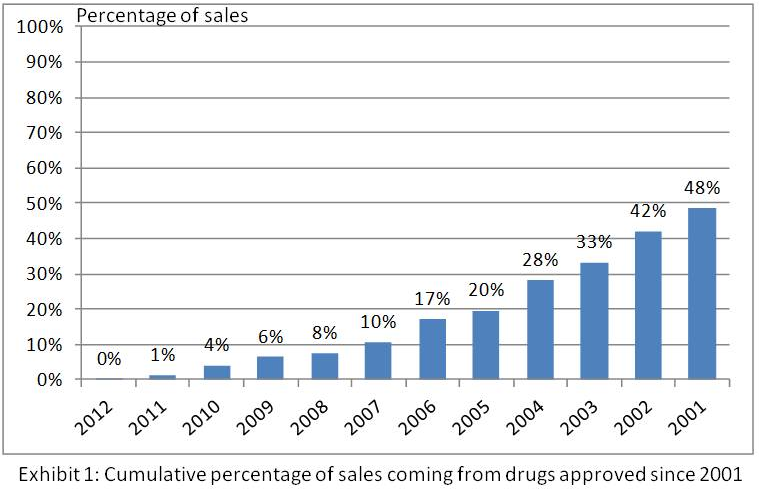 The pharmaceutical companies have produced very few new blockbuster products in the last 15 years. Most of the new medications released since 2000 have been, at best, marginally successful but, more often, complete flops. The patents on most of the popular prescription medications have either run out or are about to run out. This is why revenue for the major pharmaceutical companies has been mostly flat or declining even though the prices of their drugs have gone up by more than 70% in four years. With few new ideas, pharmaceutical companies are faced with a shrinking market share and an increasingly bleak future. Figure 2: (From linked article above.) New medications released each successive year since 2001 by the pharmaceutical companies have been increasingly less popular. In their desperation they’re raising the price of everything they’ve got left. It’s the only way they can maintain their revenue when they have less to offer each year. So, in reality, these drug prices are just the price we have to pay to keep a failing industry with no new ideas afloat.